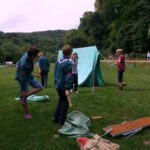 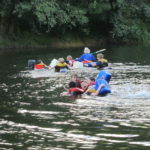 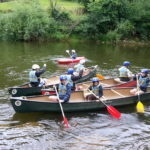 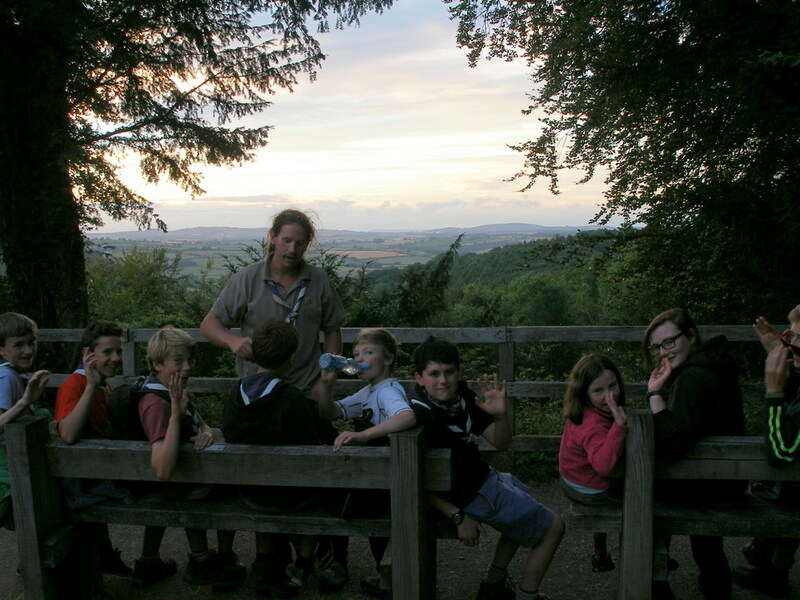 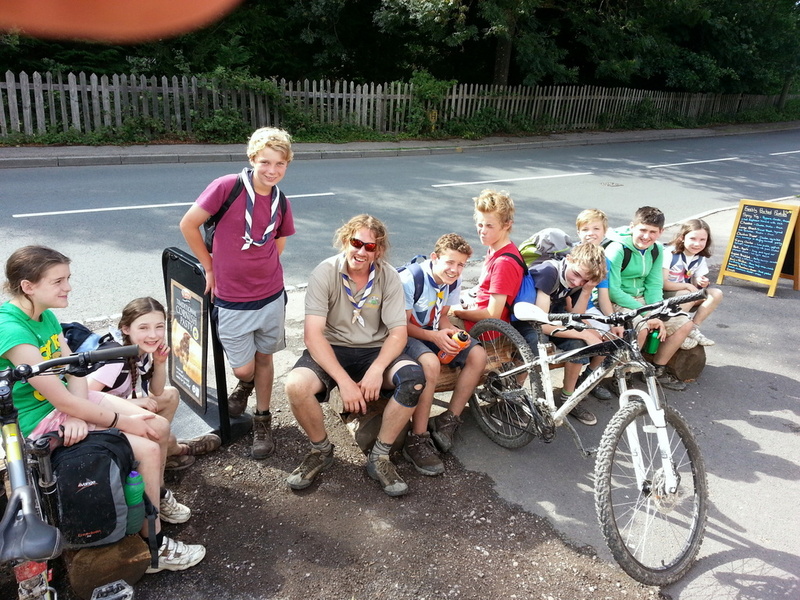 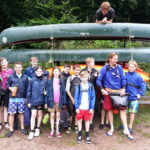 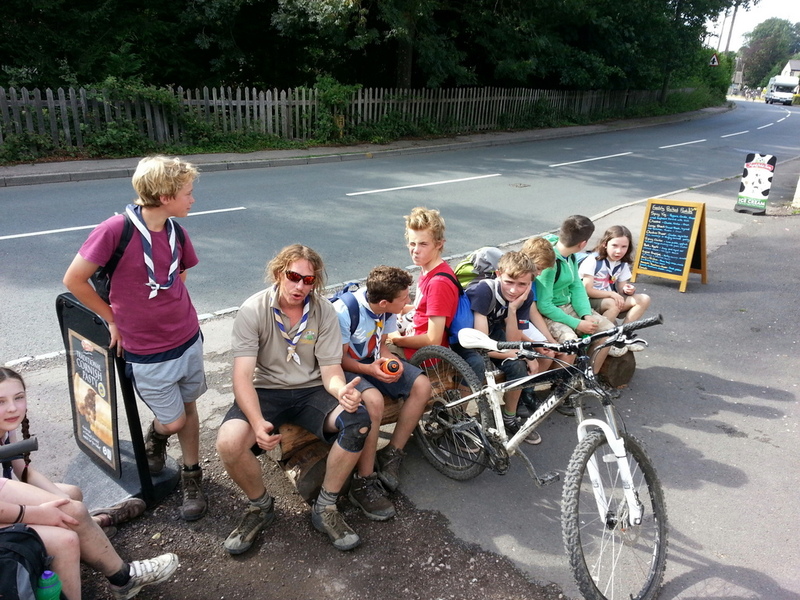 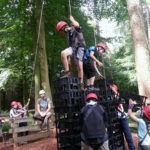 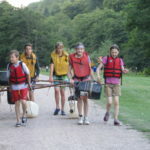 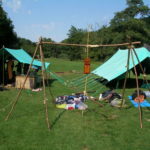 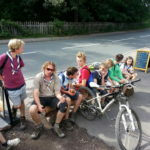 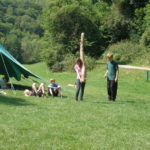 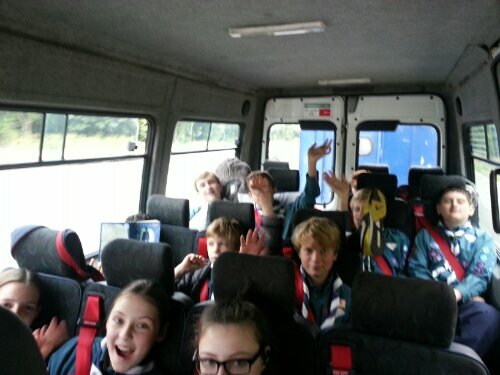 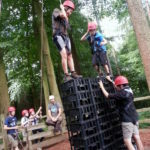 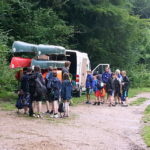 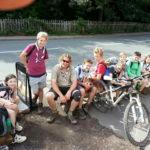 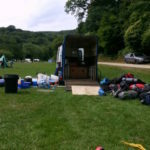 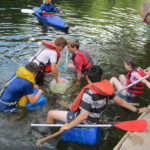 The scouts arrived back from the Forest of Dean on Saturday morning after a packed week near Symonds Yat in the Forest of Dean. 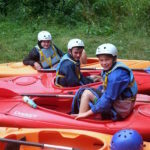 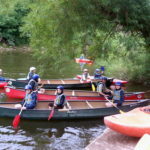 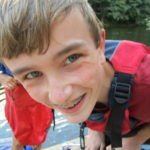 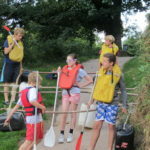 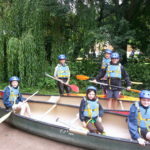 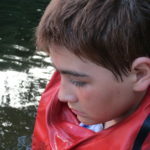 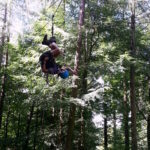 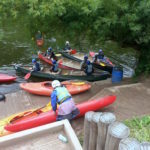 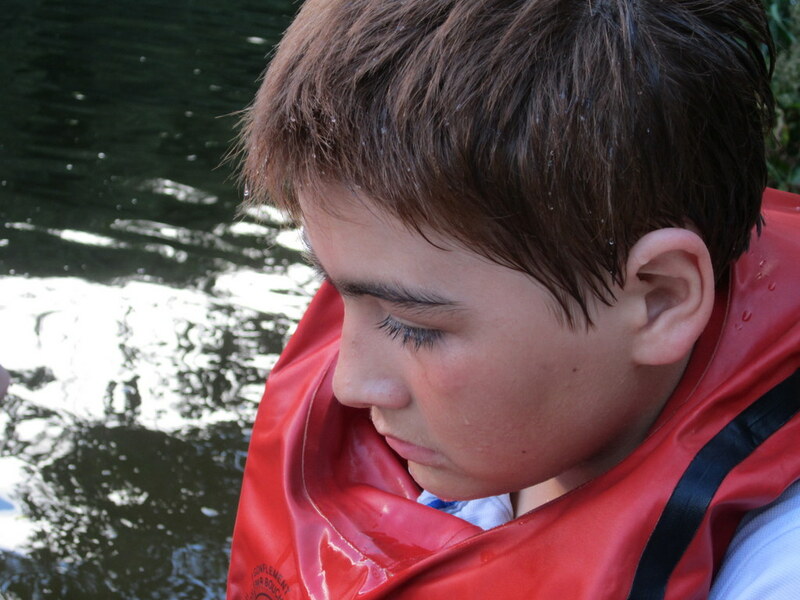 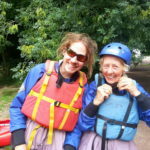 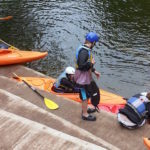 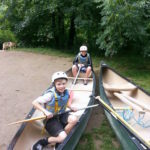 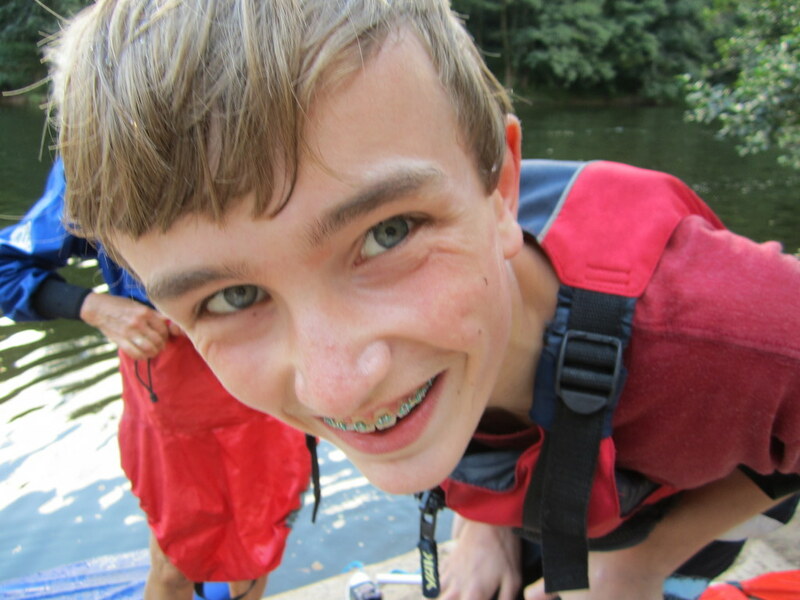 Hiking, canoeing, kayaking, geocaching, archery, zip wire, leap of faith… read on for the full story! 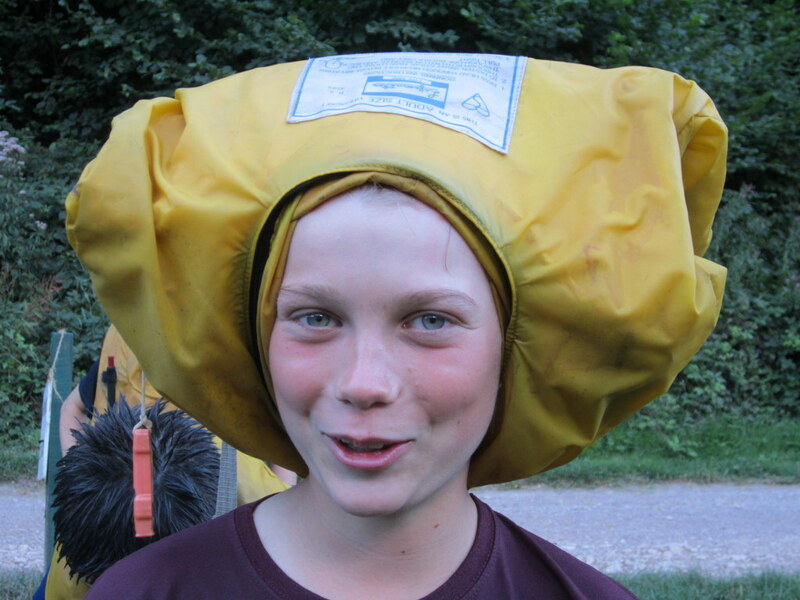 By the way, just click the photos for bigger versions. 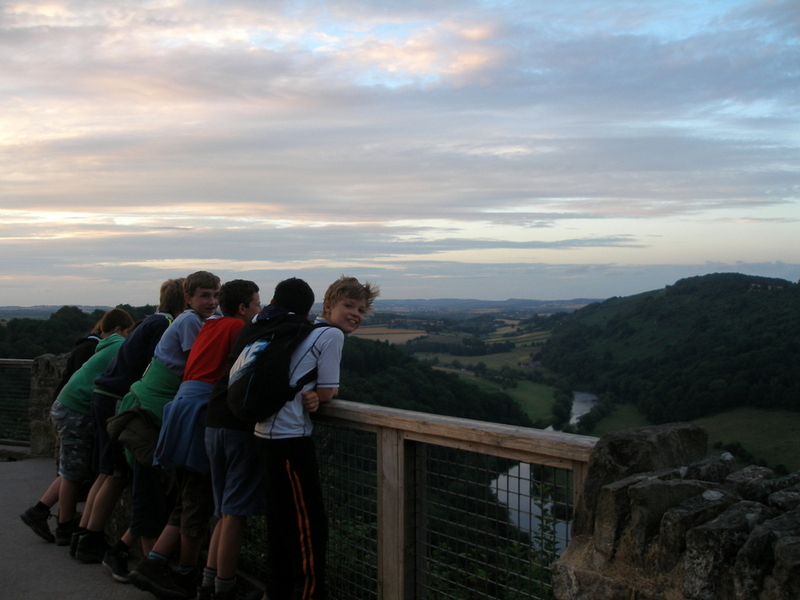 After an early start on Saturday morning we travel to Biblins Campsite, which is near Ross-on-Wye in Herefordshire. 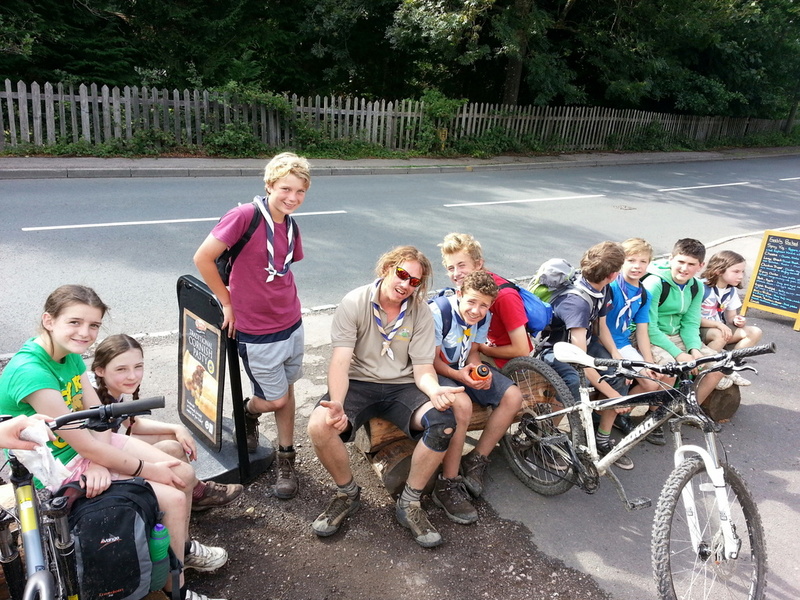 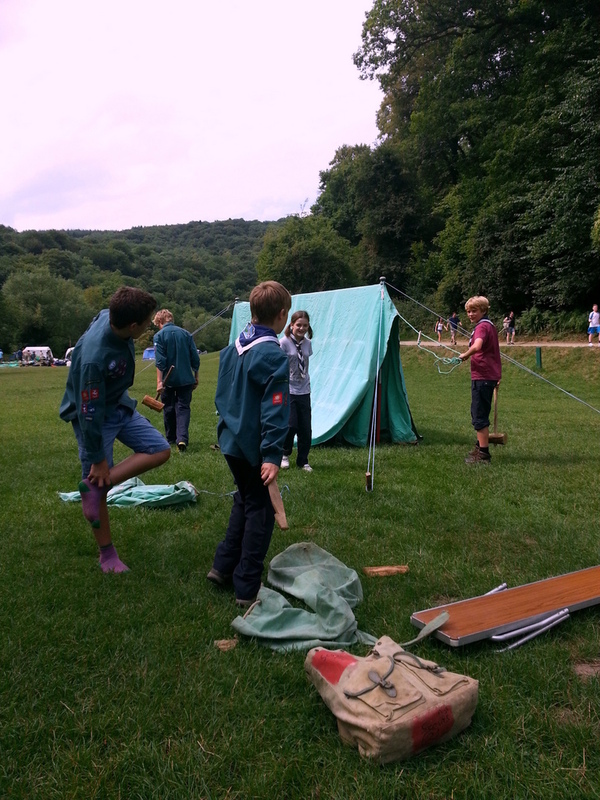 The scouts did a great job pitching camp, with all the main things up and running in time to cook dinner. 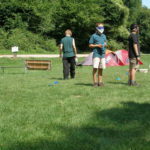 We finished setting-up camp and then the scouts took turns doing some in-camp orienteering and introducing themselves to our neighbours. 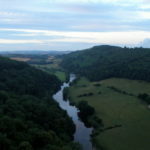 The fickle weather in the Wye Valley saw us rushing for our waterproofs in the afternoon. 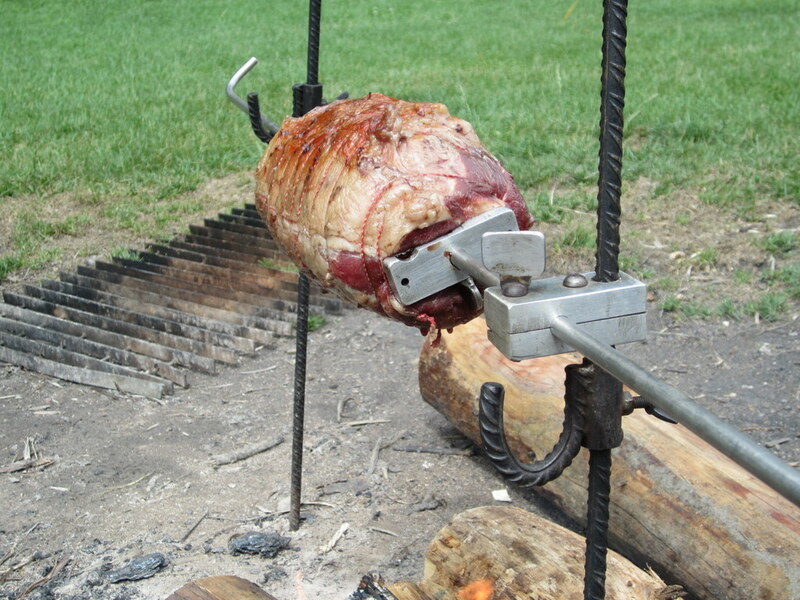 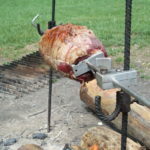 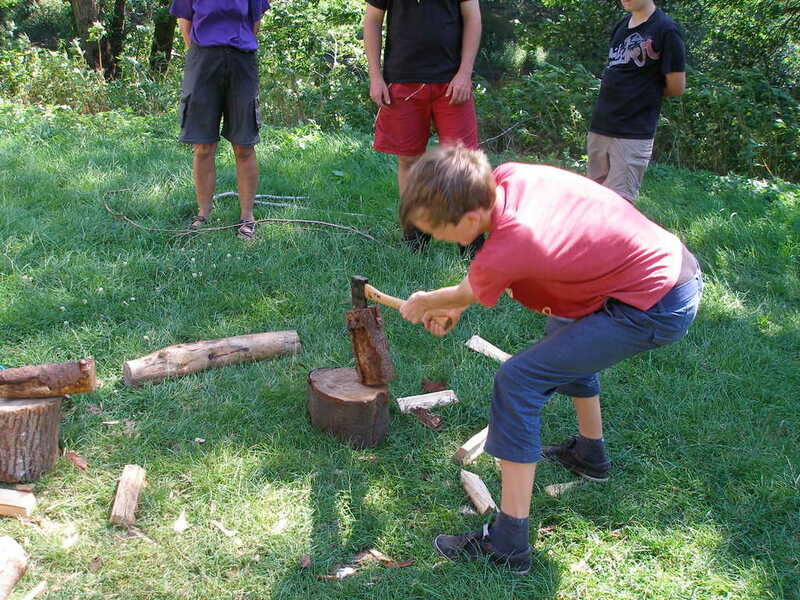 Nigel ran a refresher on the use of axe and saw before the traditional Sunday dinner on camp of spit-roast beef and yorkshire puddings! 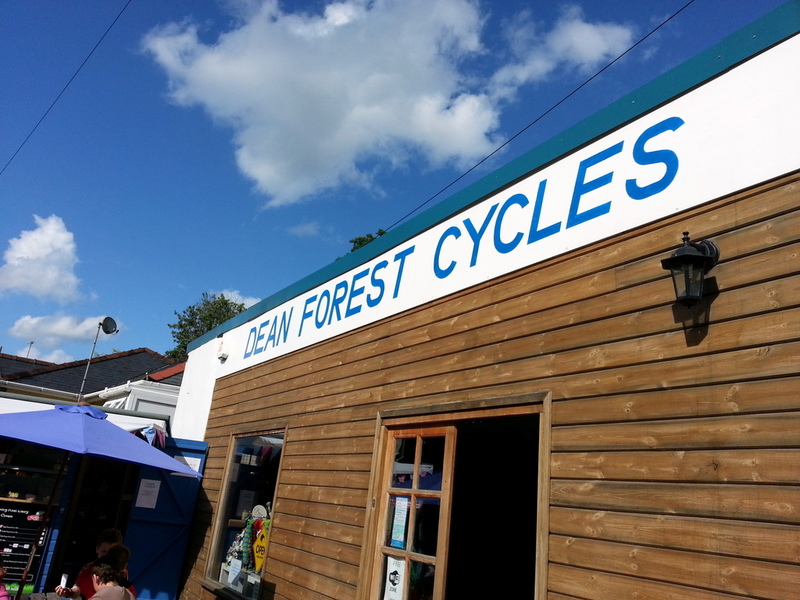 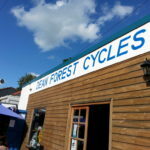 Mountain biking from Park End up to the Verderes’ Trail in the Forest of Dean. 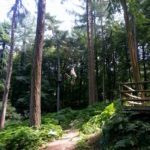 The Verderers’ Trail is rated as one of the best MTB courses in the country and everyone found it challenging but (generally) enjoyable. 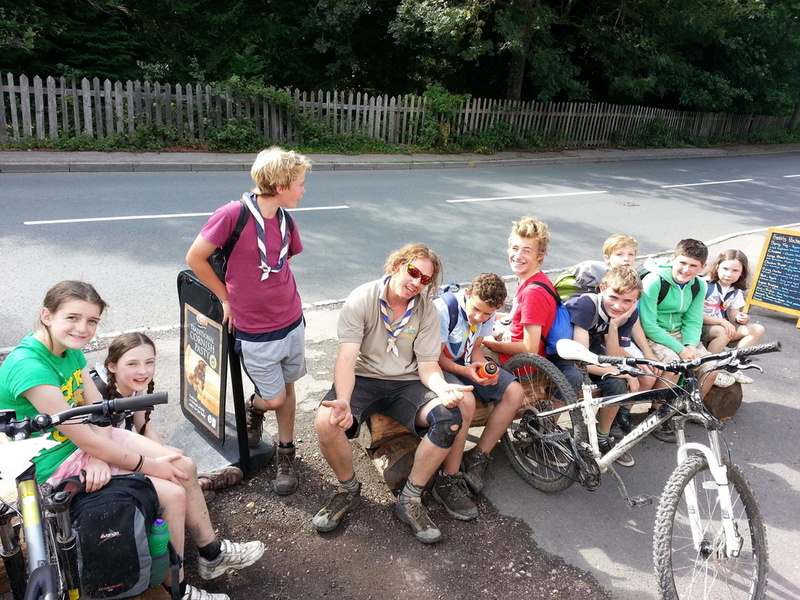 Unfortunately, Michael had a spectacular crash right at the end resulting in a trip to A&E. 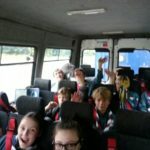 YouTube has some great videos of the trail and a few people crashing! 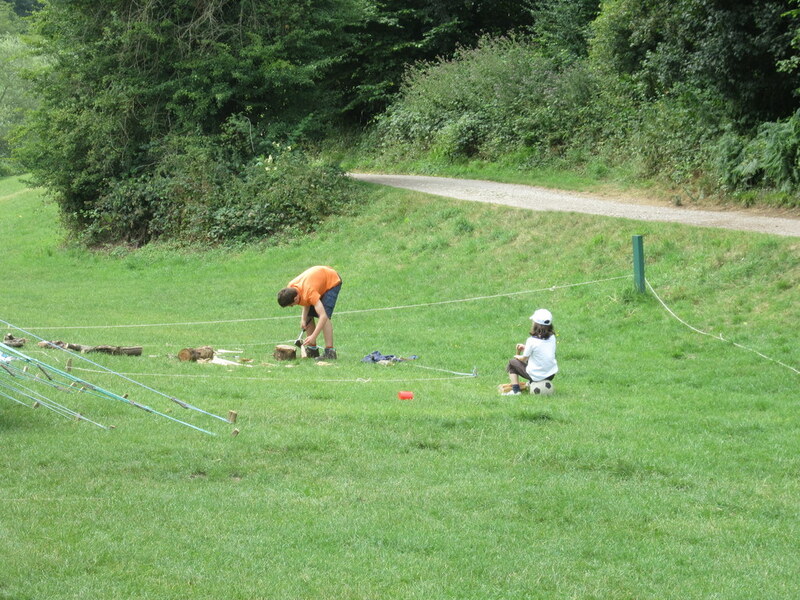 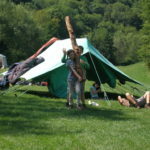 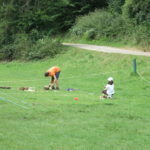 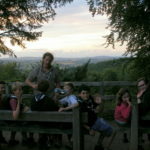 In the evening we played a new wide game ‘fox hunting’ – which worked really well in the terrain near near the campsite. 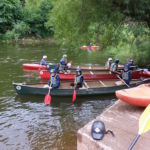 Gorge scrambling had to be cancelled due to lack of water in the gorge, Instead we went canoeing and kayaking on the River Wye, travelling from Kern Bridge to the campsite at Biblins. 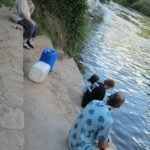 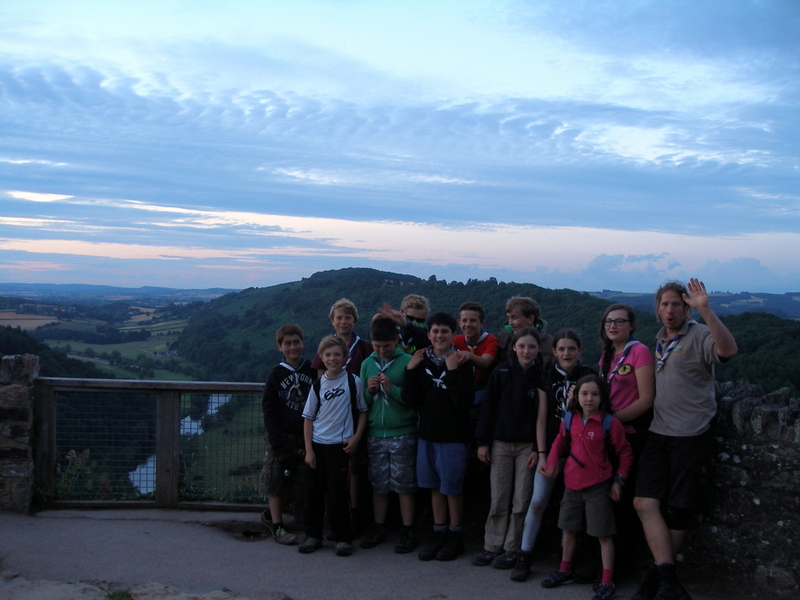 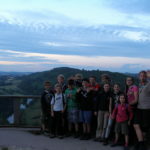 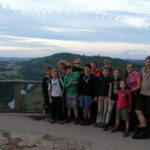 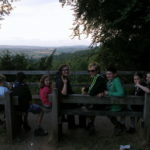 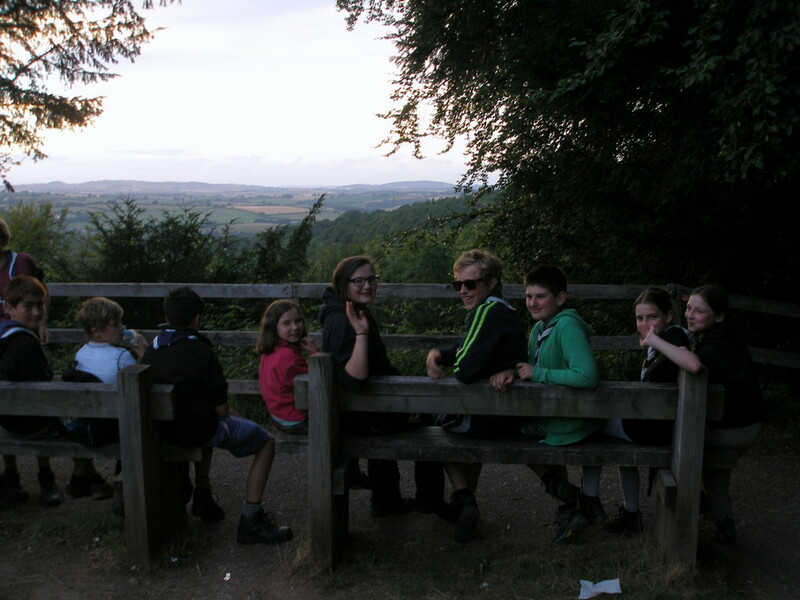 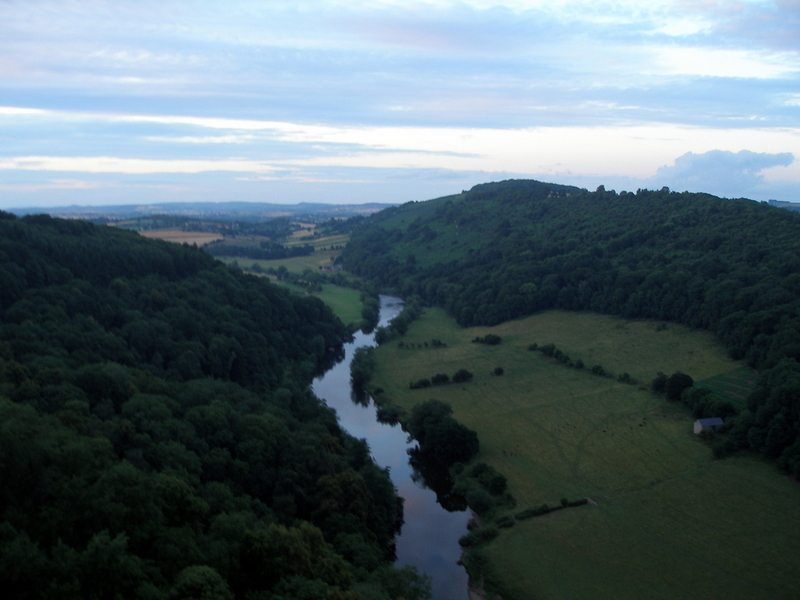 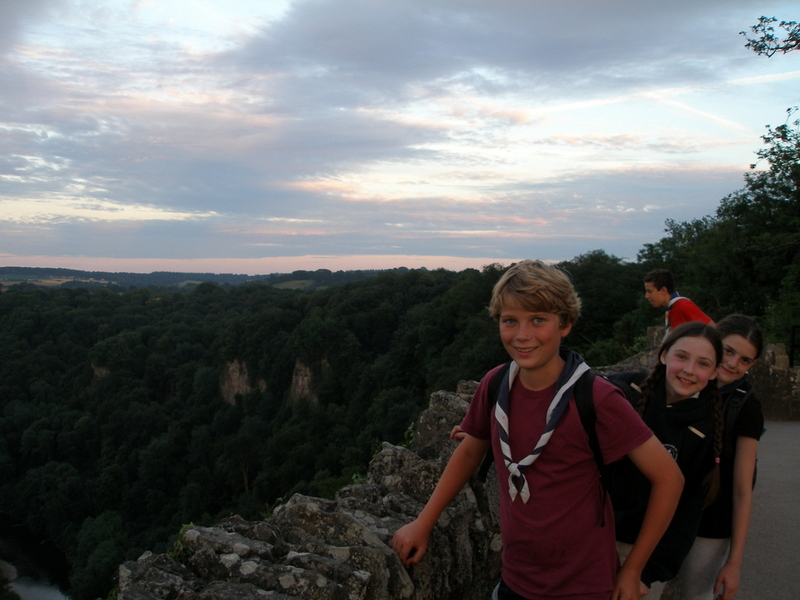 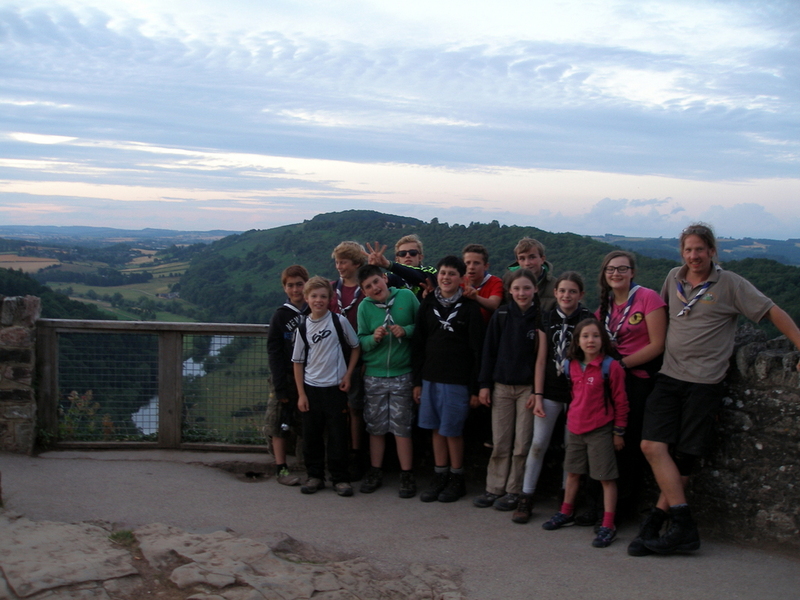 In the evening we walked to Symonds Yat and appreciated the view from the rock. 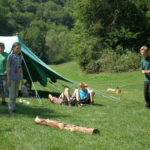 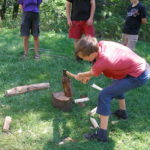 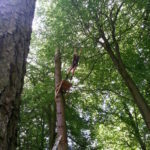 In the afternoon the scouts completed their Forestry Badge where they learned about natural and commercial woodlands, how the trees are managed differently. 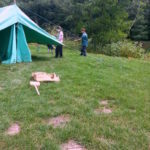 They learned how to recognise trees using their shape, bark and leaves. 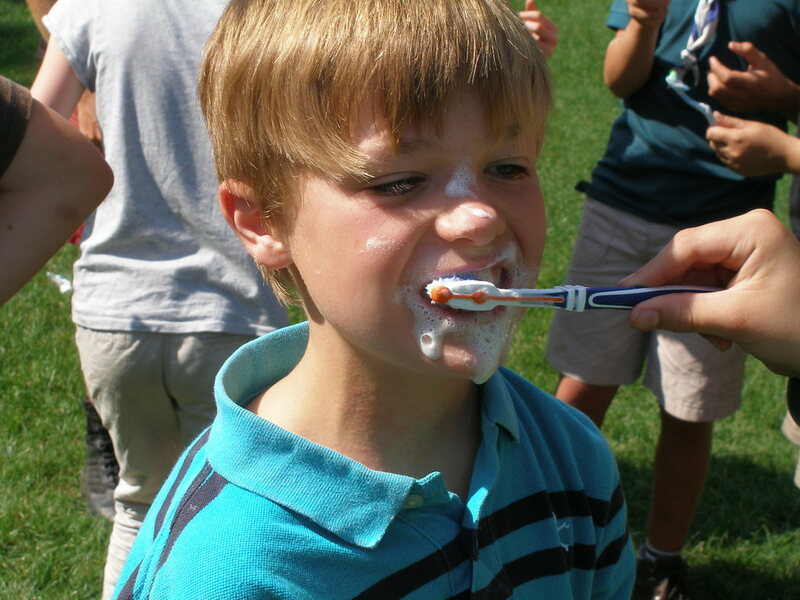 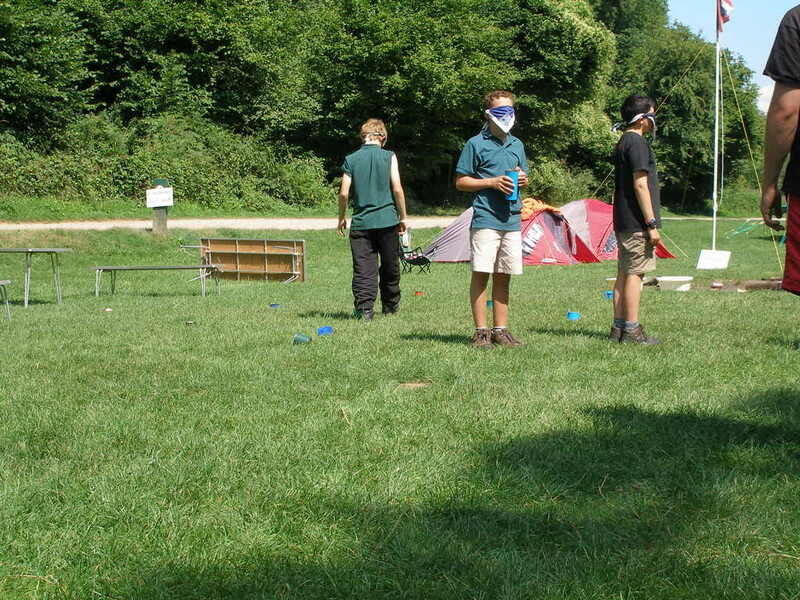 They were then challenged to collect samples of trees in different categories. 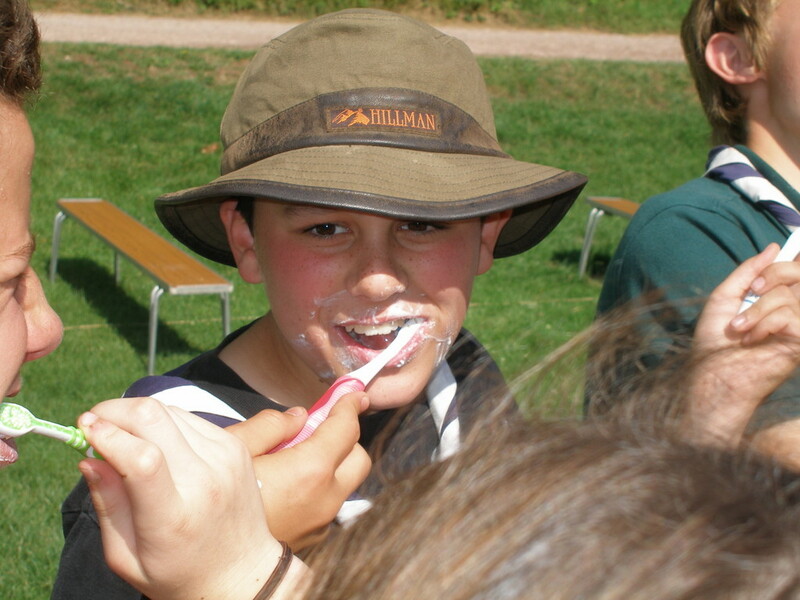 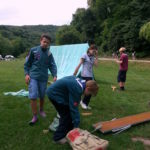 The evening meal was the cookery competition – unfortunately, due to some inclement weather, the scouts managed to eat everything before we got the camera out! 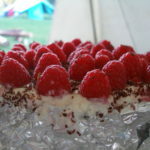 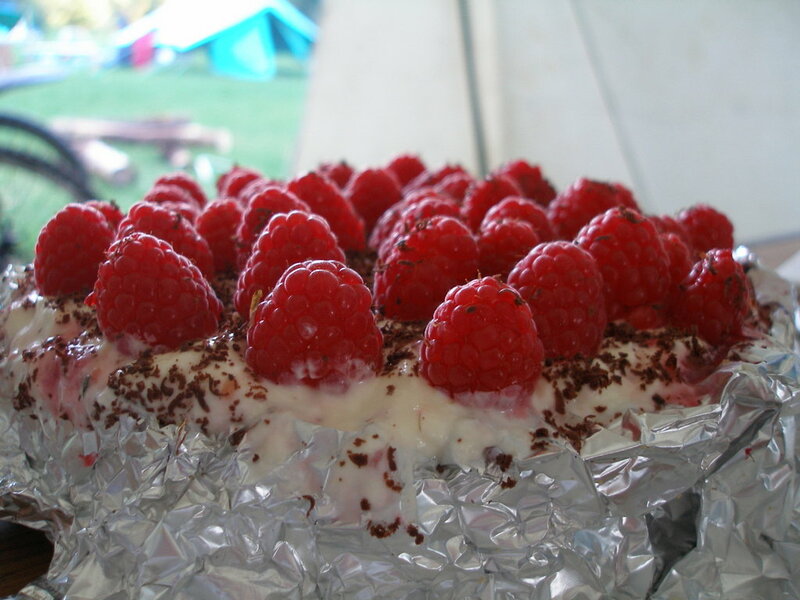 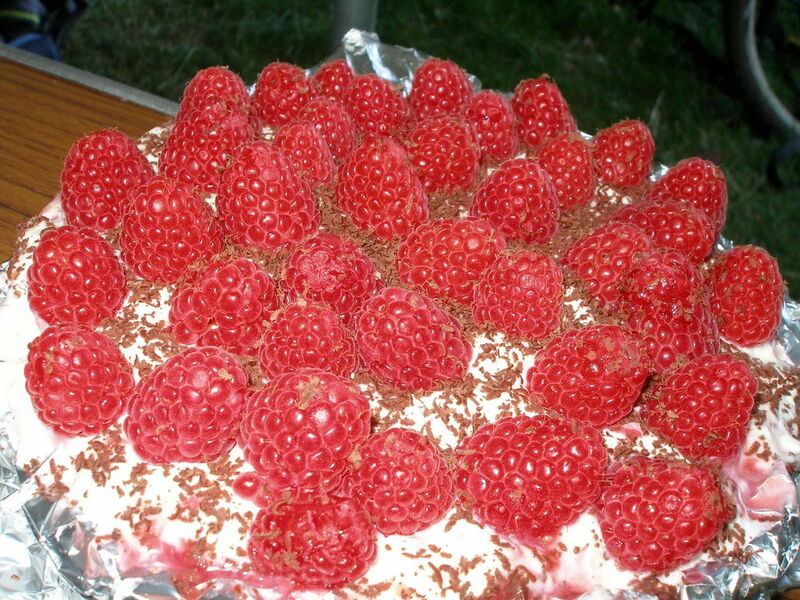 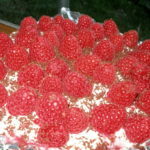 The only photo we have is of the leader’s raspberry cheesecake. 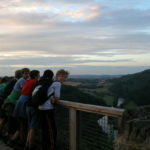 On Friday morning we walked to Berry Hill campsite on the other side of the Wye valley. 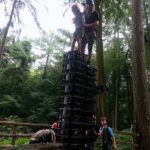 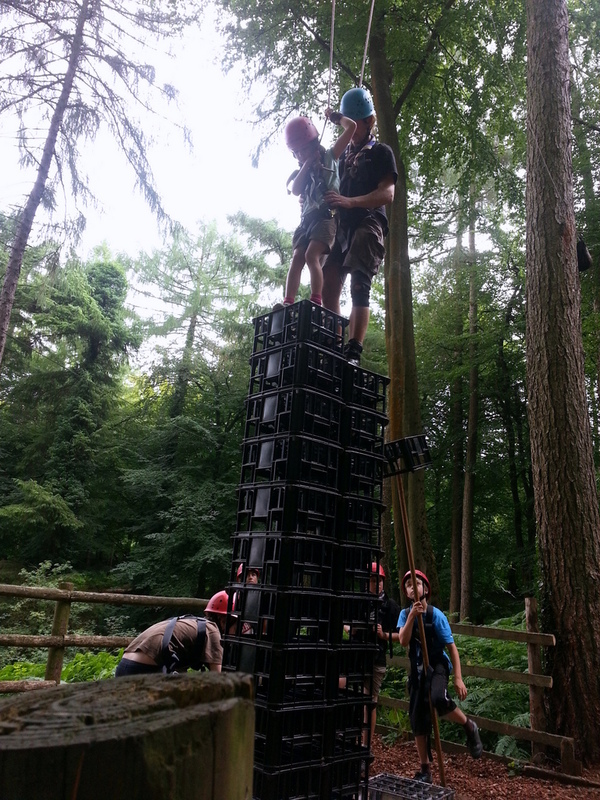 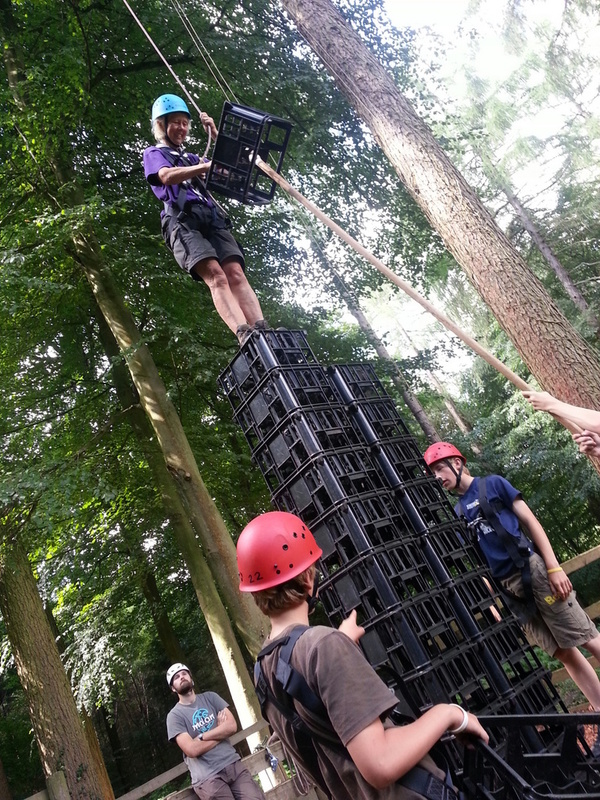 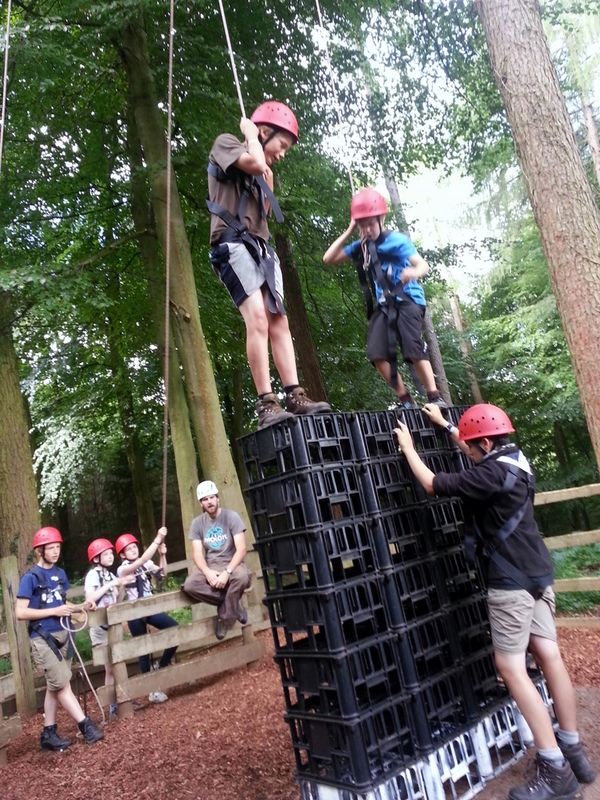 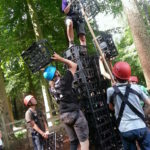 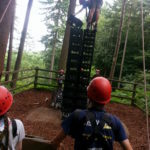 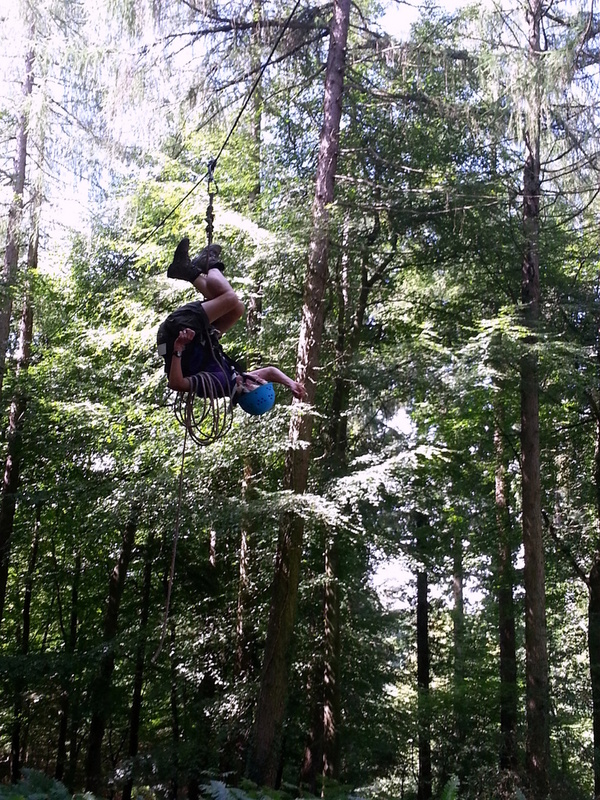 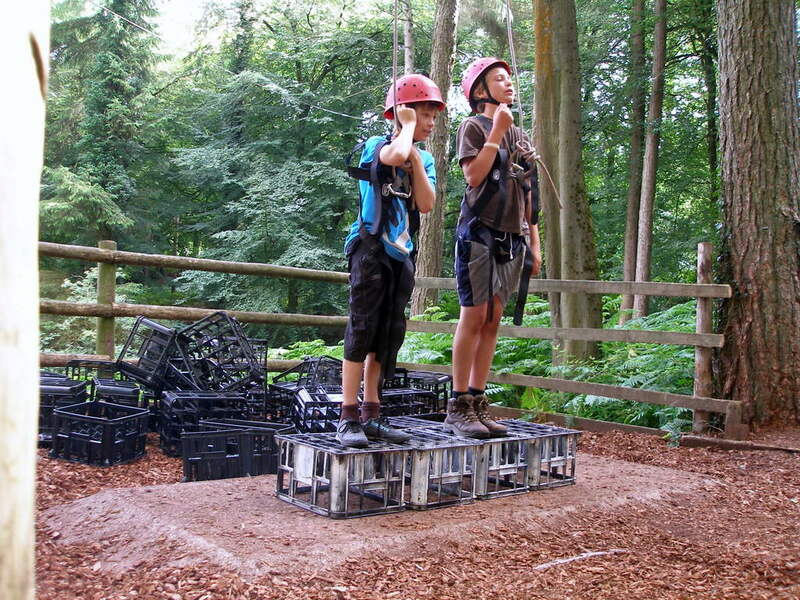 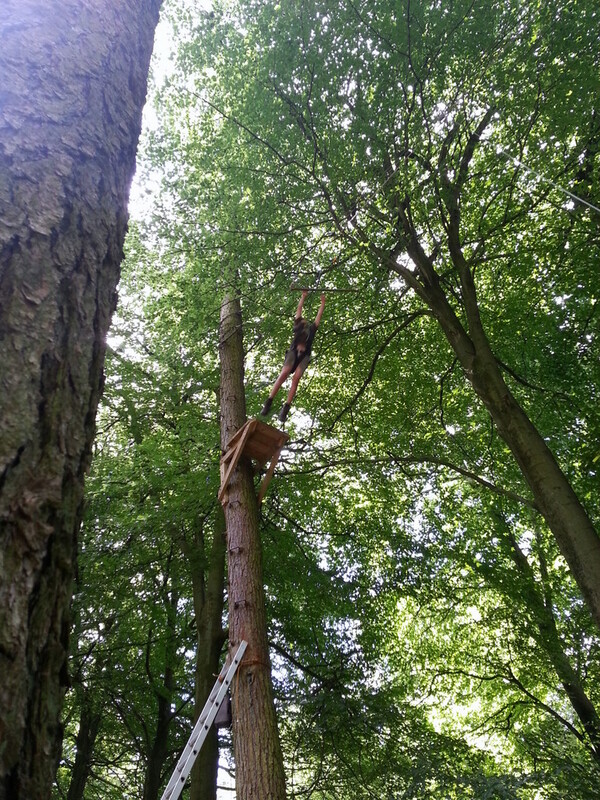 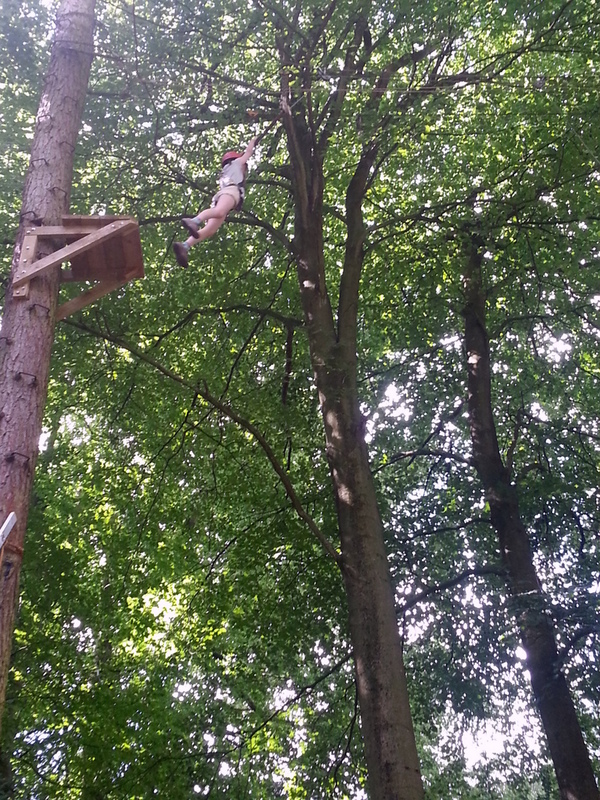 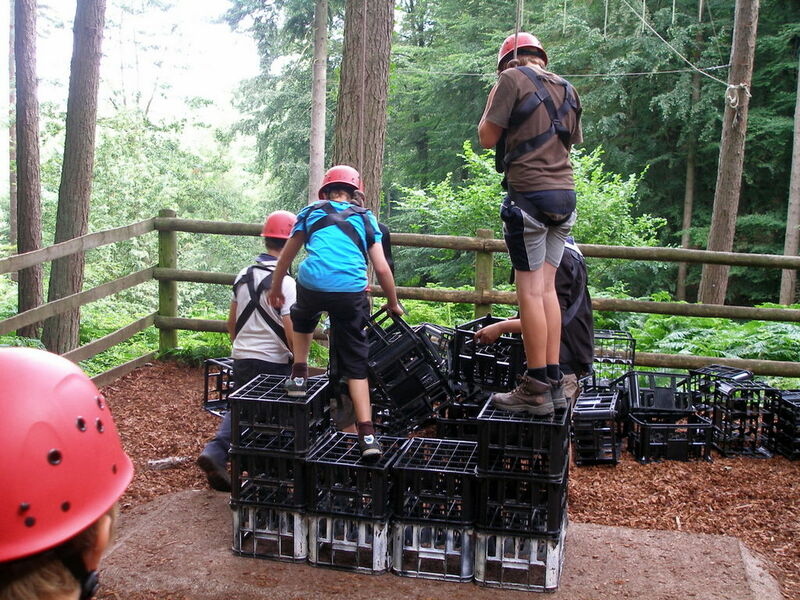 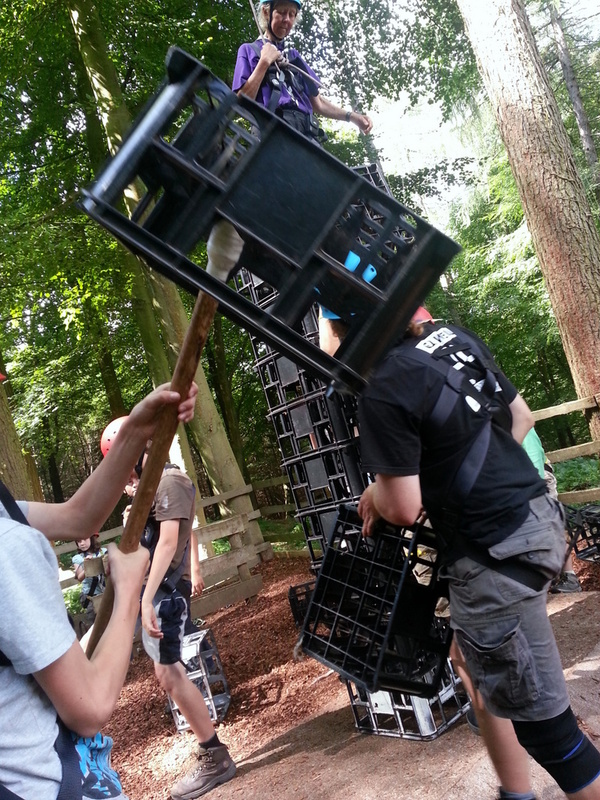 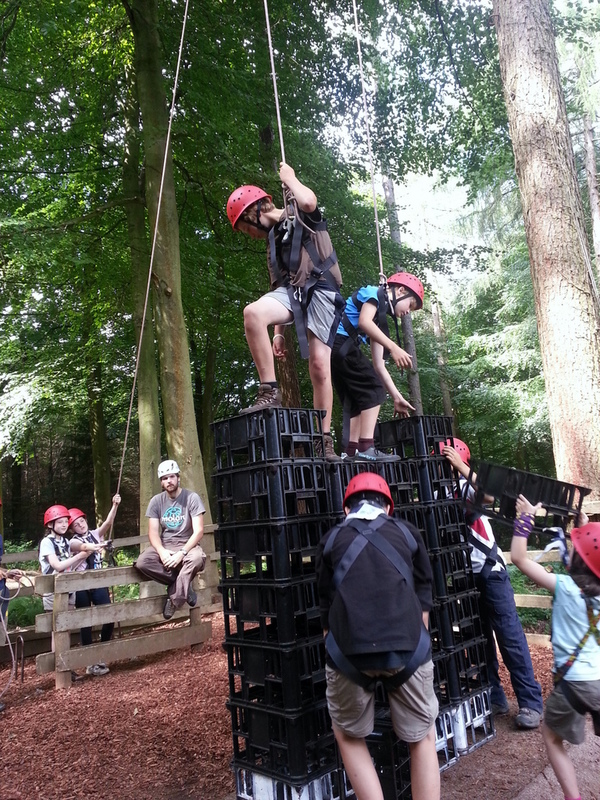 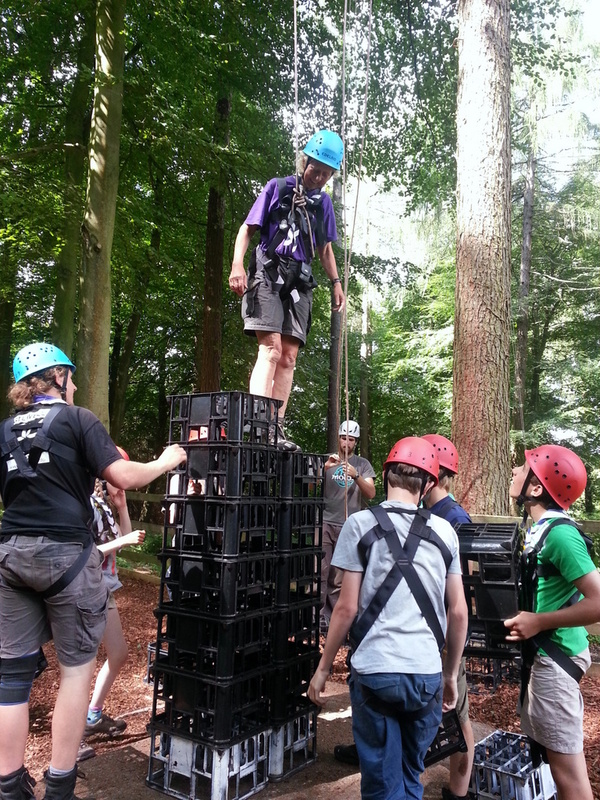 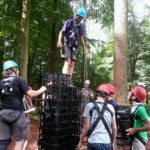 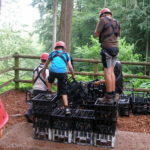 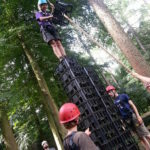 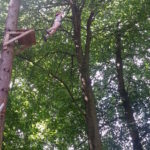 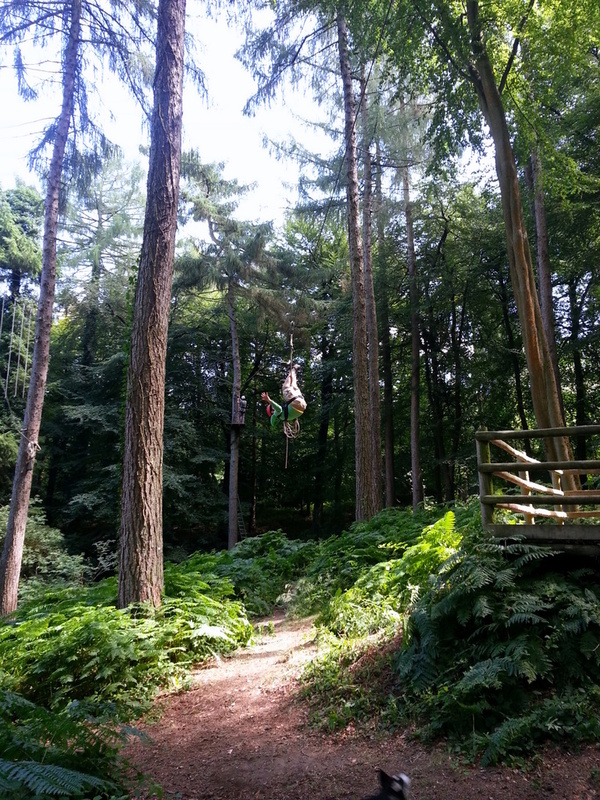 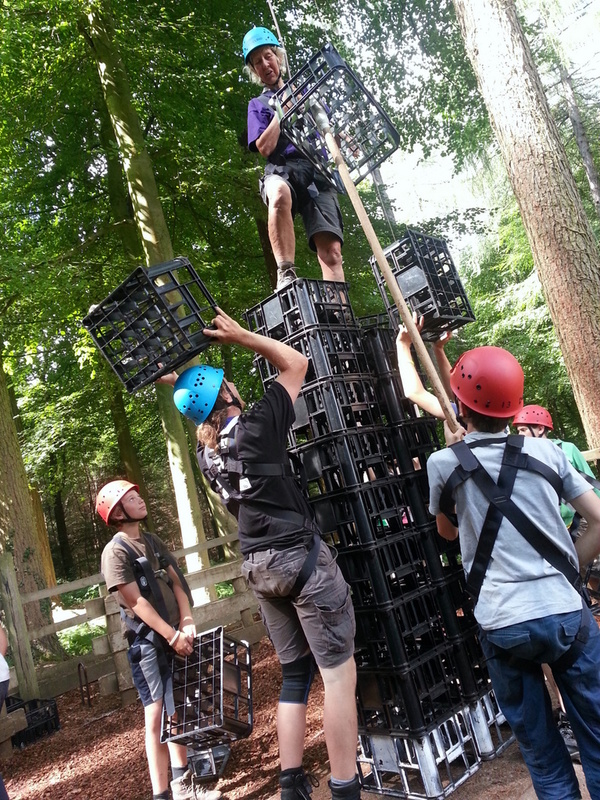 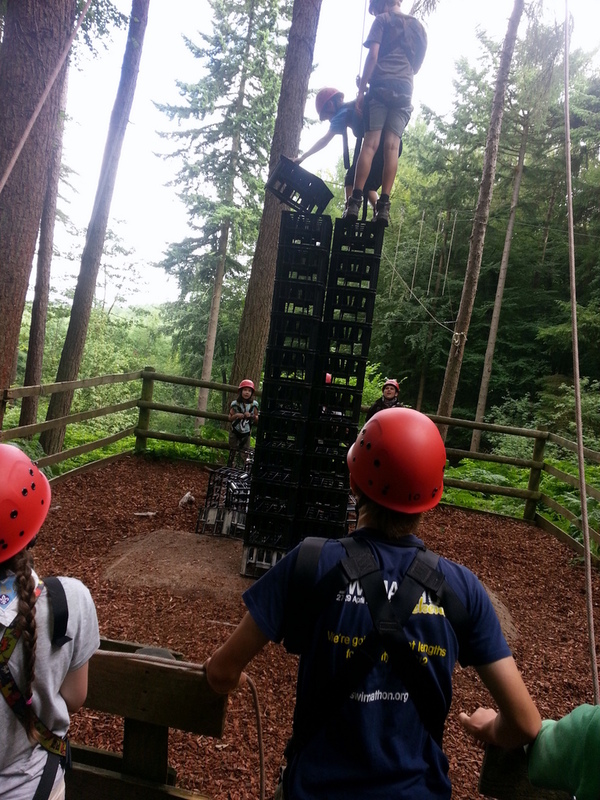 We completed their high-ropes adventure: crate stacking (won by Sheila), leap of faith and zip wire. 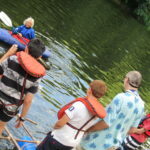 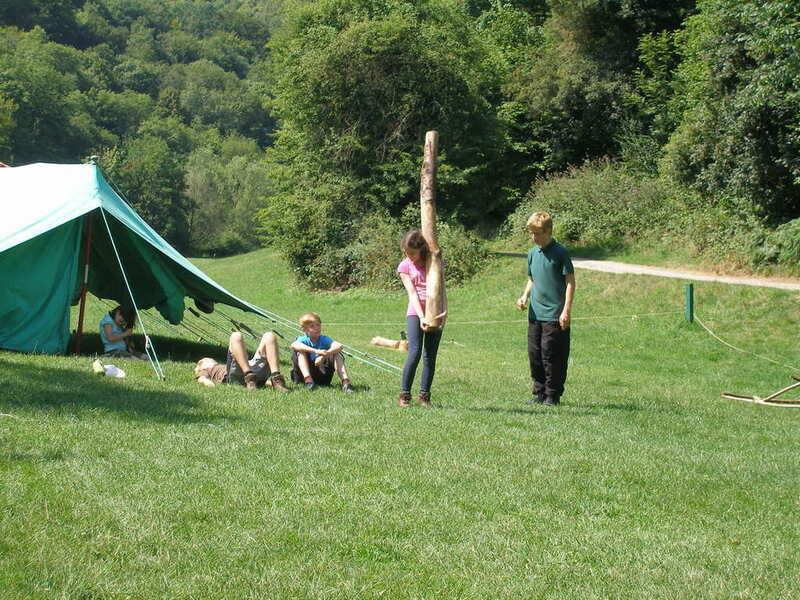 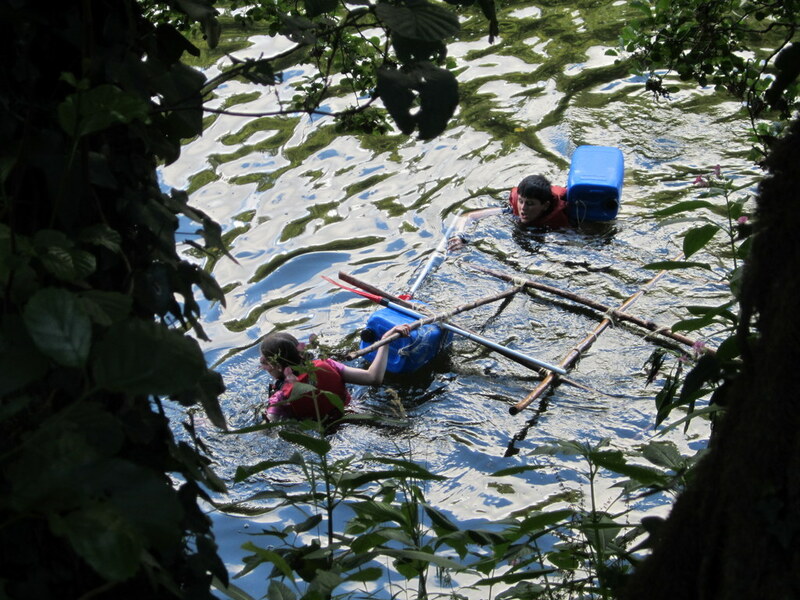 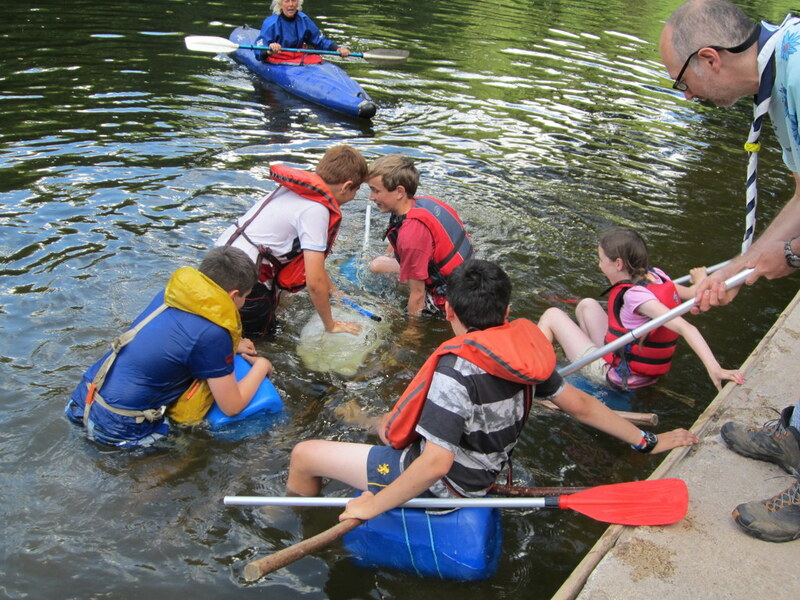 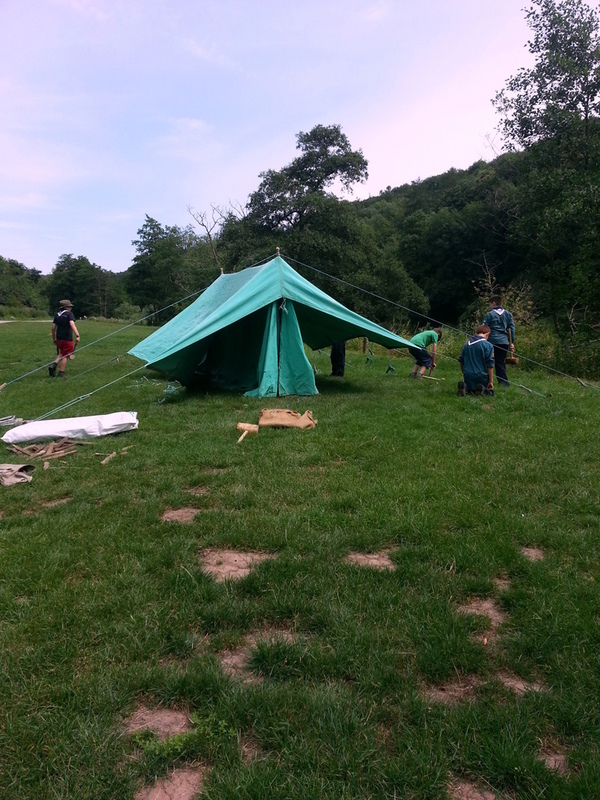 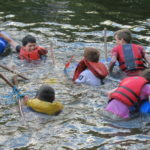 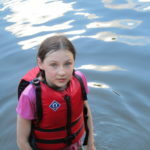 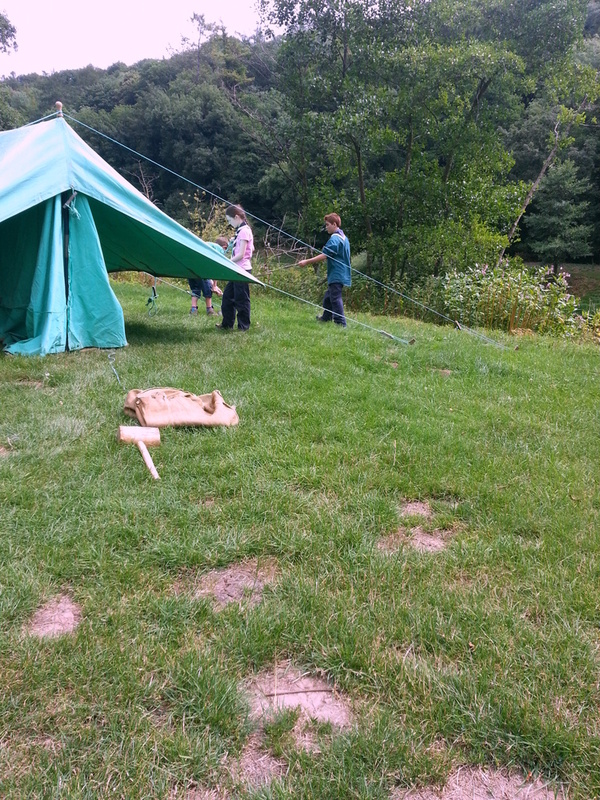 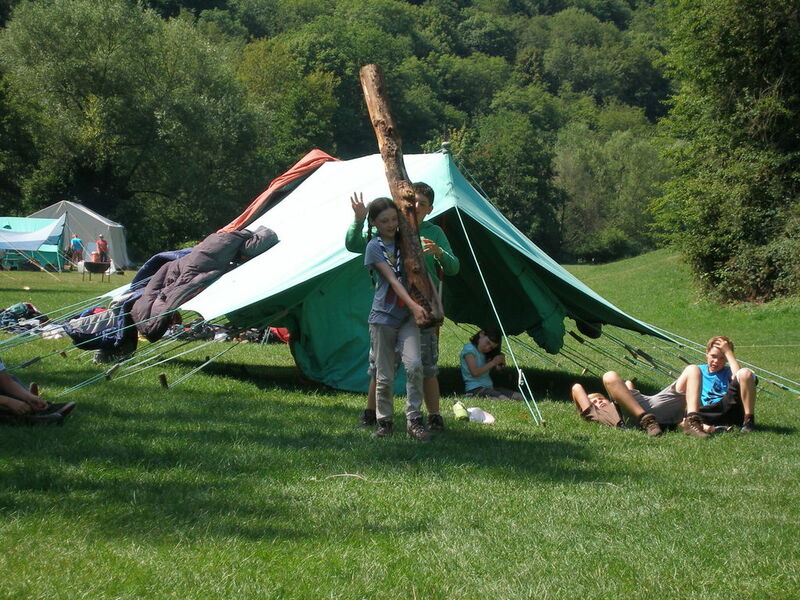 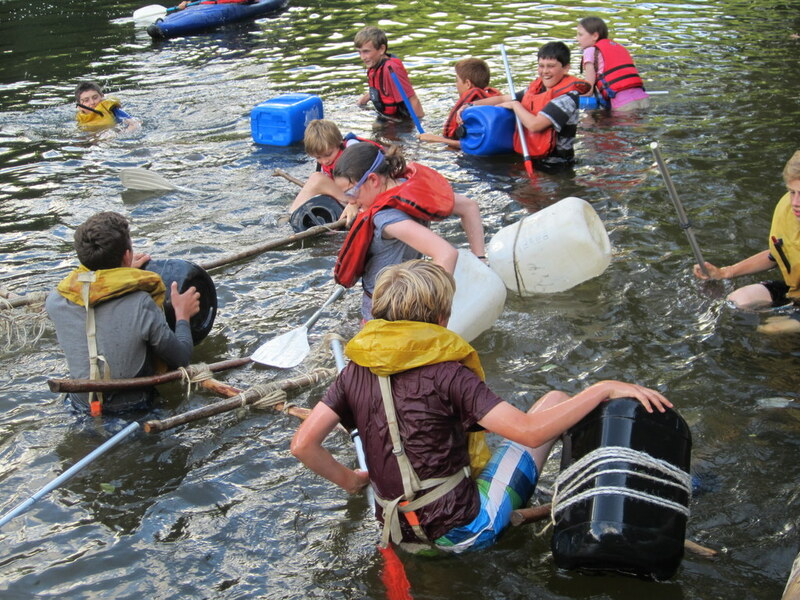 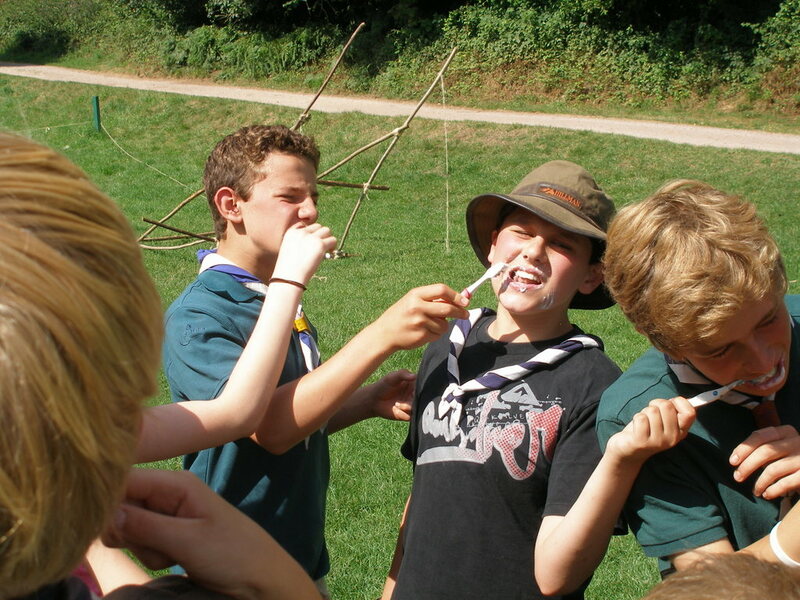 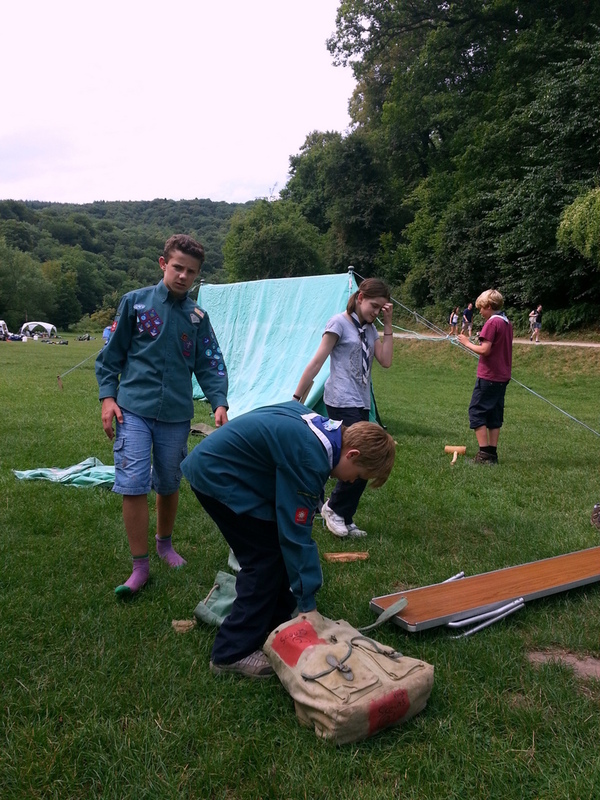 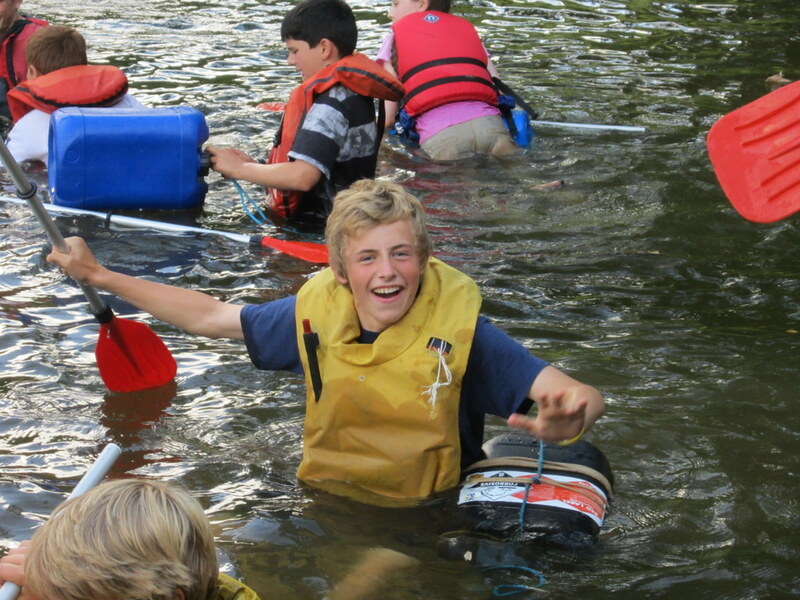 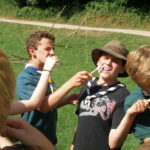 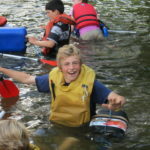 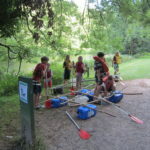 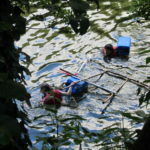 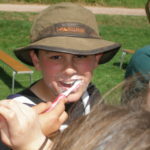 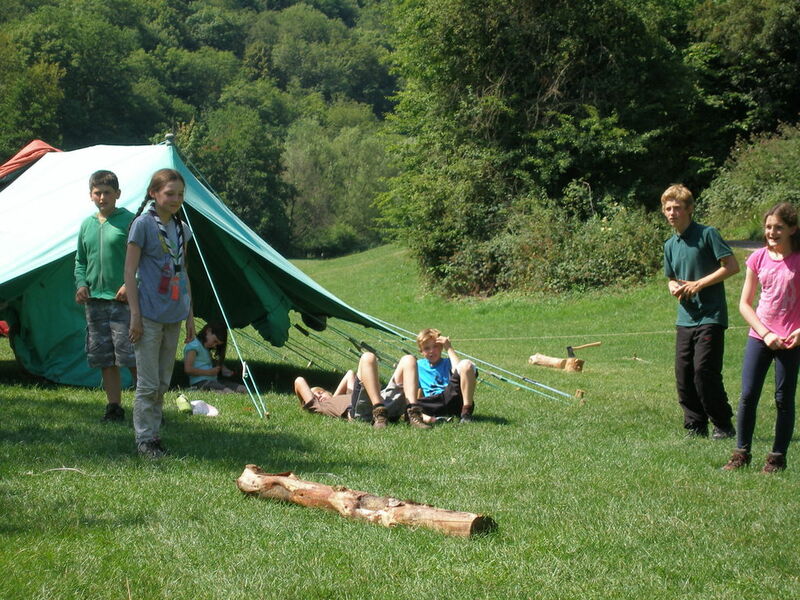 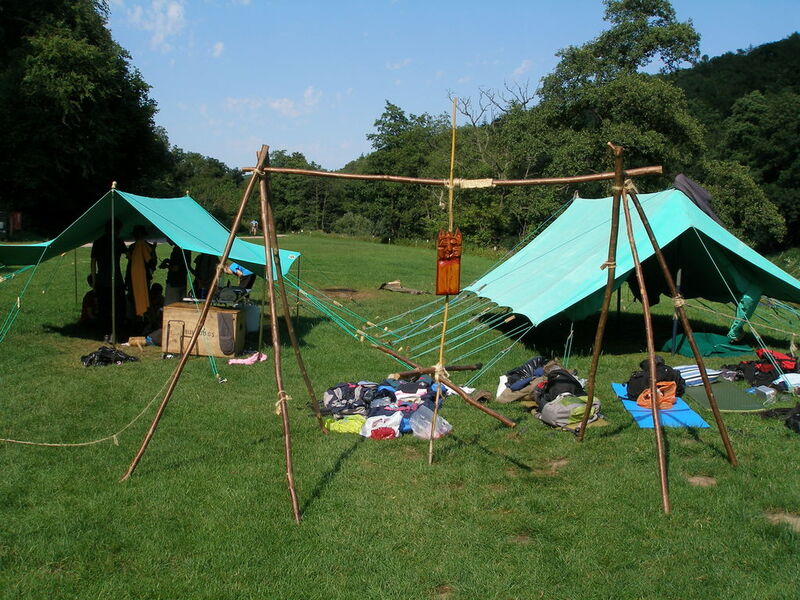 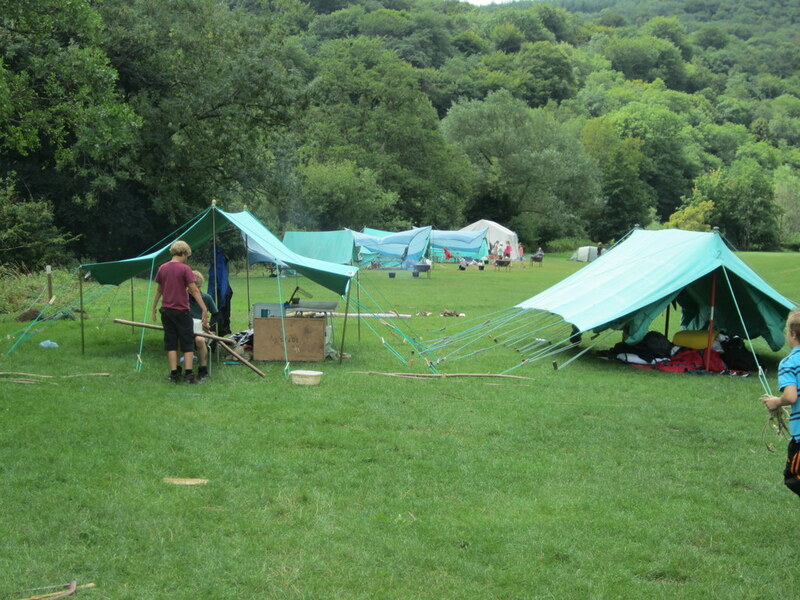 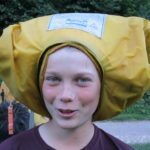 In the afternoon we packed the patrol tents and personal kit, before testing the rafts the scouts had built. 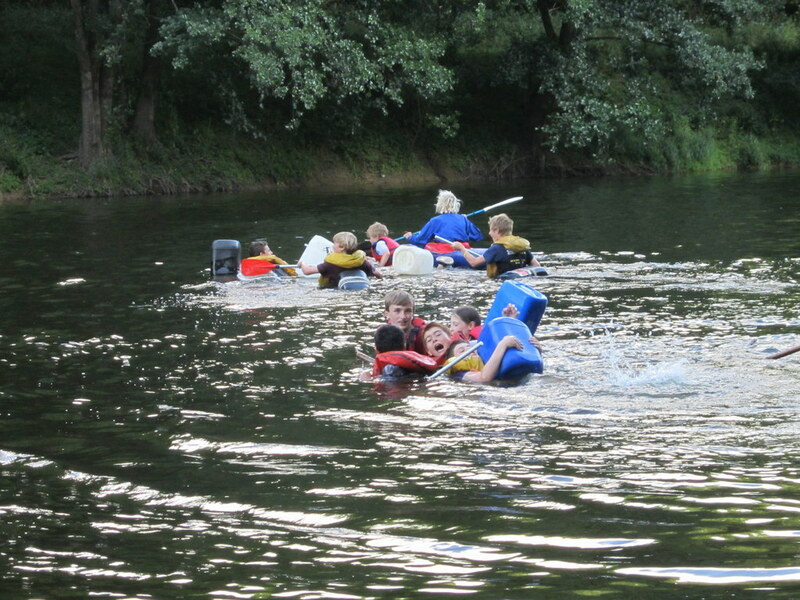 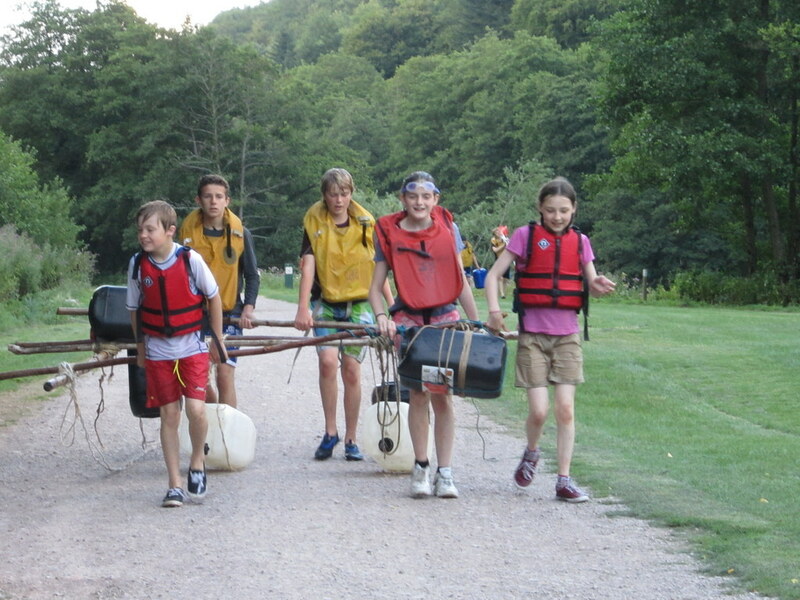 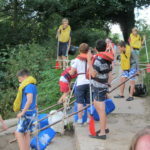 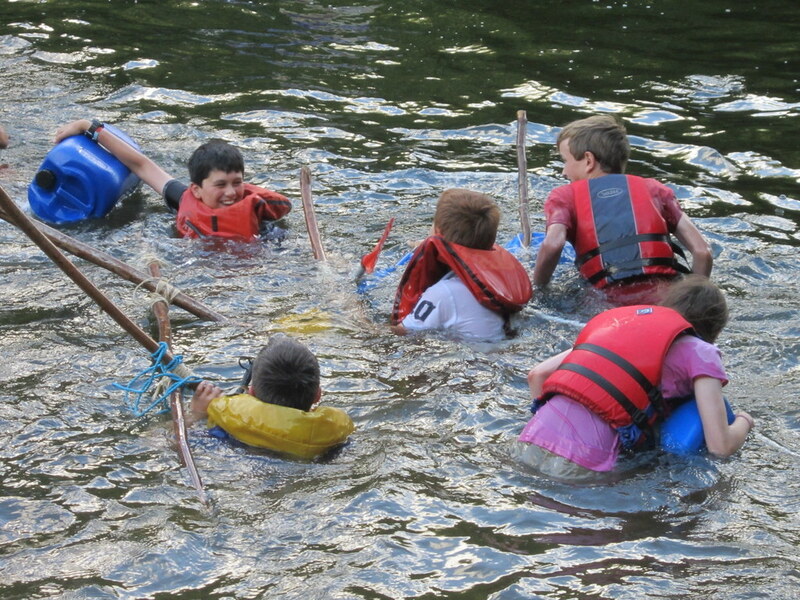 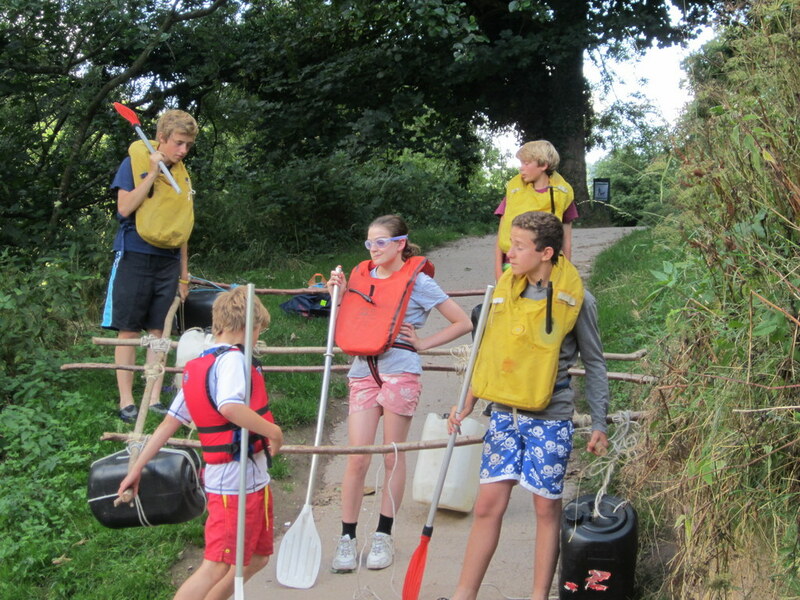 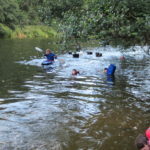 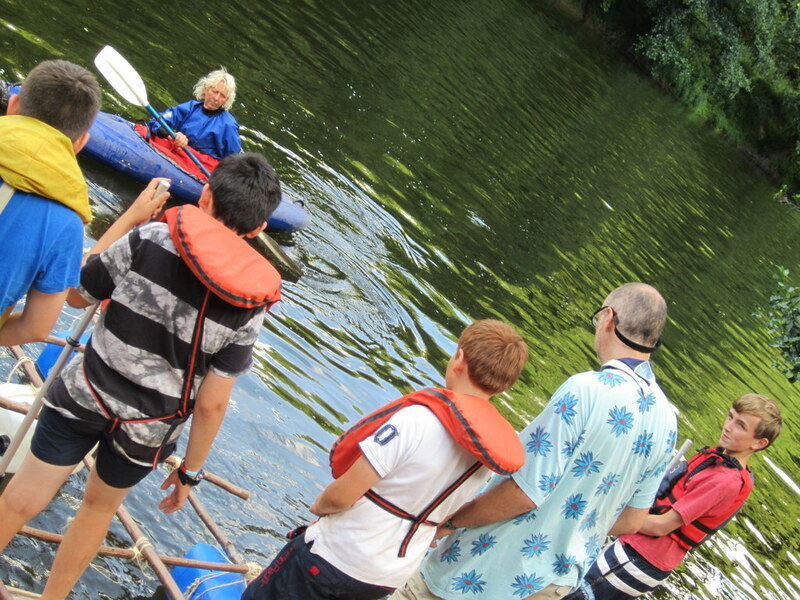 The rafting wasn’t entirely successful – after the scouts had carried them the 150m to the slipway, most of the barrels had fallen off! 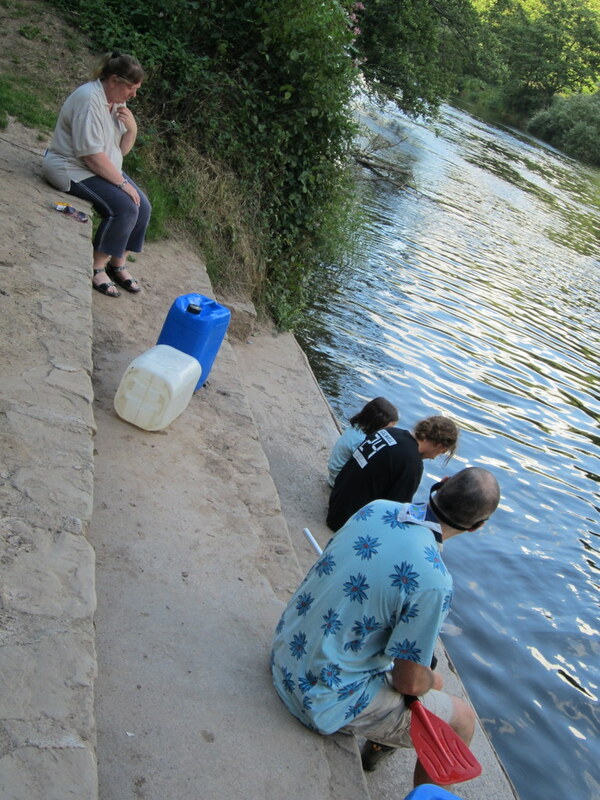 After a brief session fixing them up, the next test was to put them in the water and cross the Wye. 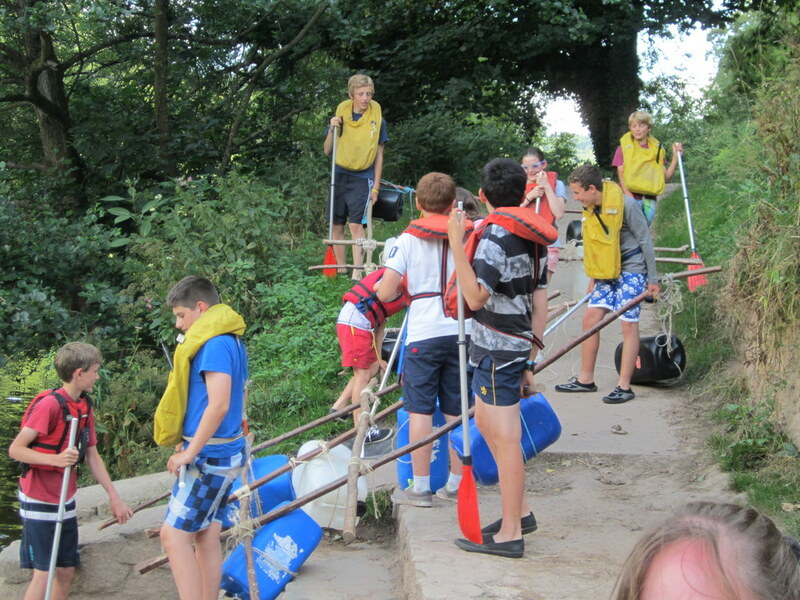 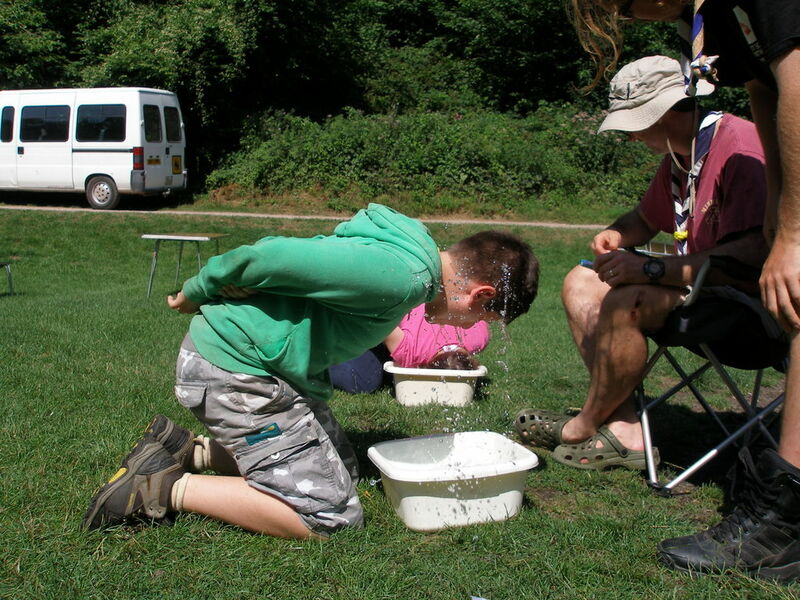 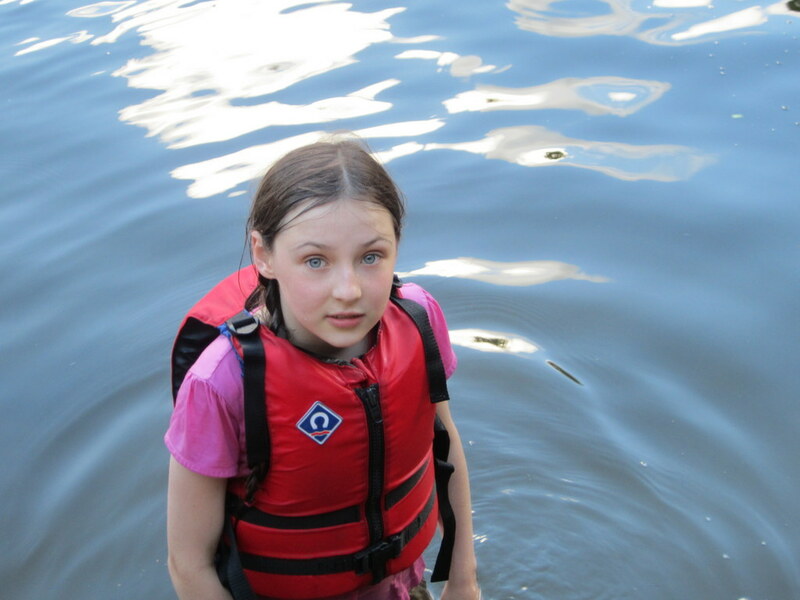 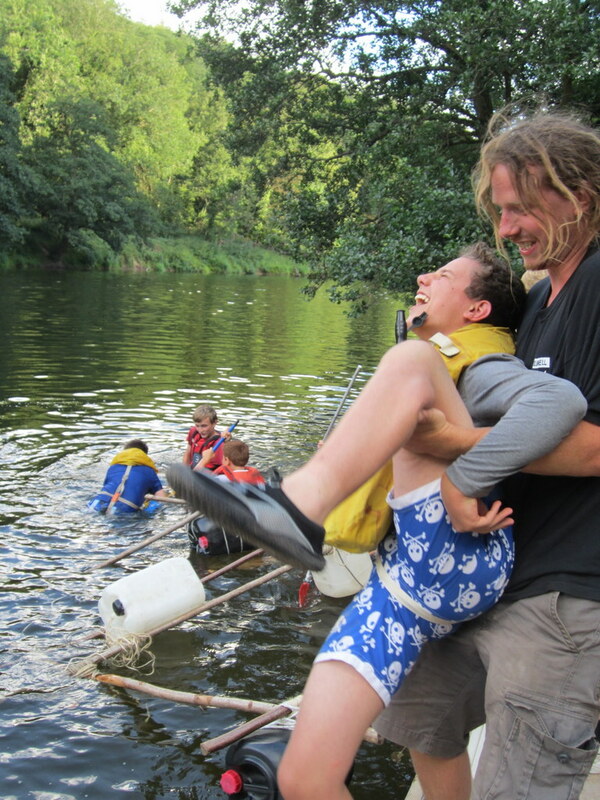 As you can see from the photos, the river was a test too far! 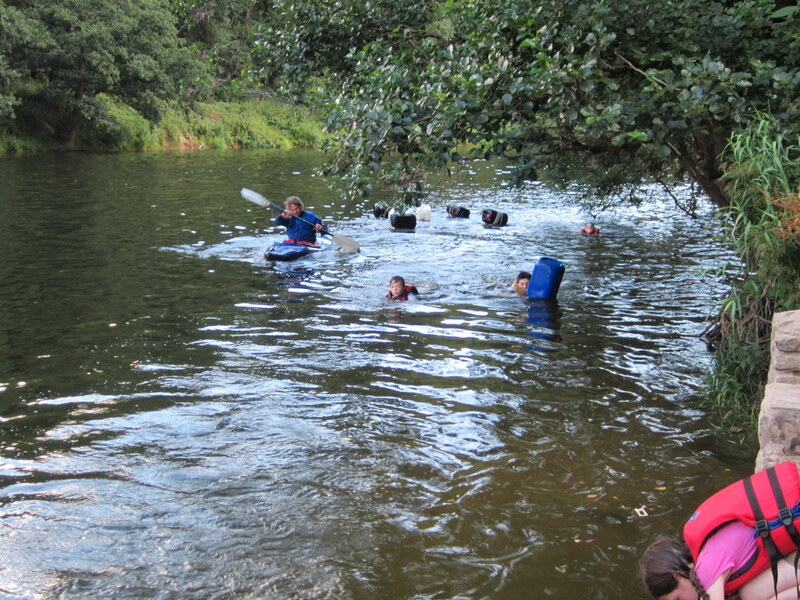 The kayak was put to use rescuing the two teams. 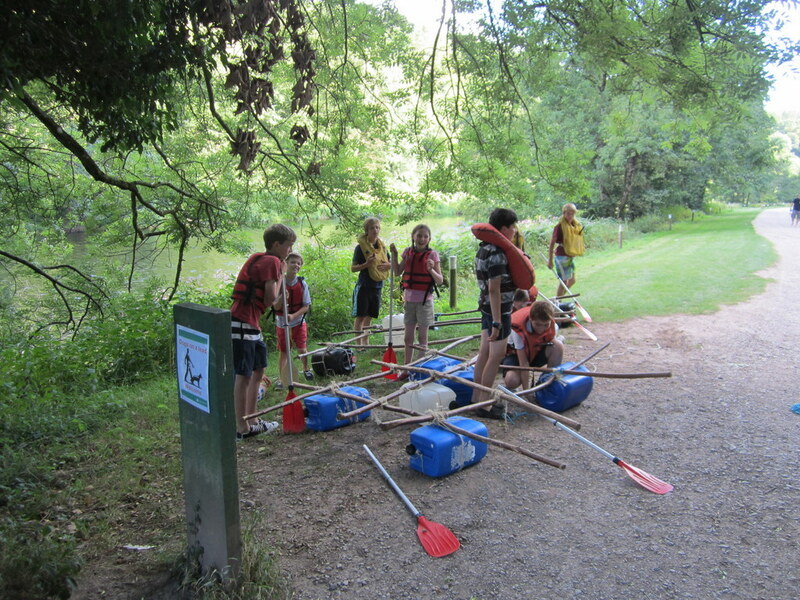 The rafting finished just in time because just before dinner there was an almighty downpour. 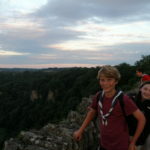 The scouts did well to make their evening meal. 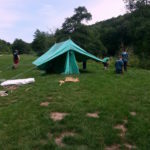 Unfortunately it did mean that our campfire was a washout, but it did make for an interesting evening bivouacking in King Arthur’s Cave with thunder and lightning crashing and booming outside. 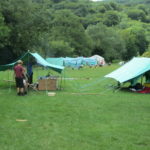 The scouts had a breakfast hike back from the cave, after which we struck camp before hitting the motorway for the journey home. 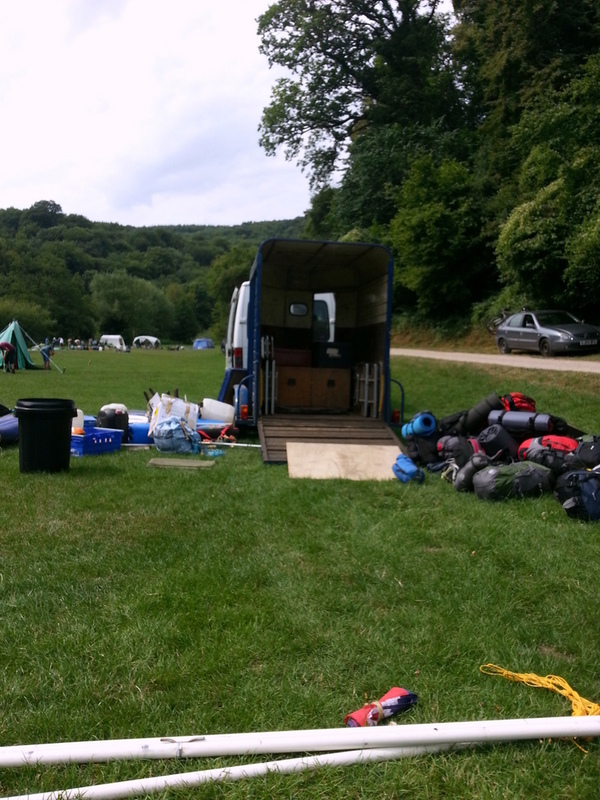 Goodbye Herefordshire until next time!